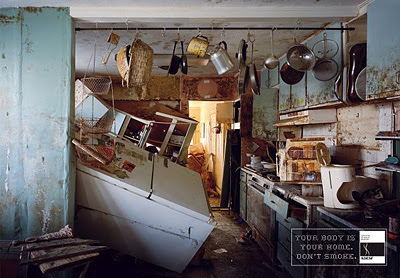 "Your Body is Your Home. Don't Smoke" is the slogan - there has been a little (but not that much as far as I can tell) discussion about these adverts from an award winning Anti-Smoking campaign in Brazil - here and here. 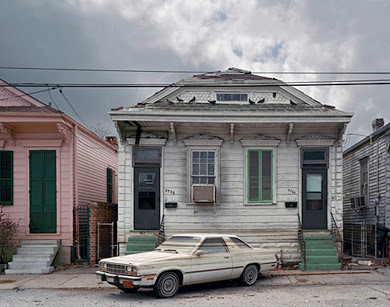 The intriguing thing is that they use images of domestic devastation from work that Robert Polidori made in New Orleans and the Gulf Coast post-Katrina. Then Bill Griener wrote some fairly angry posts about photographs that Polidori made of a victim of Katrina who had died in his own bed. Bill felt it was a terrible invasion of privacy and a fairly awful thing to do (I felt conflicted about it - a big part of me agreed with Bill and completely understood his reaction, but I also wasn't quite sure what was that different about Polidori's photographs and the probably hundreds or thousands of intimate photographs of the dead and injured from wars and disasters around the globe - oft times in their own hones - about which we tend not to make so much noise in terms of ethics. I think that it was in the USA somehow brought home the potentially callous nature of such photography). Which brings us to these recent photographs - or rather the use to which they have been put. 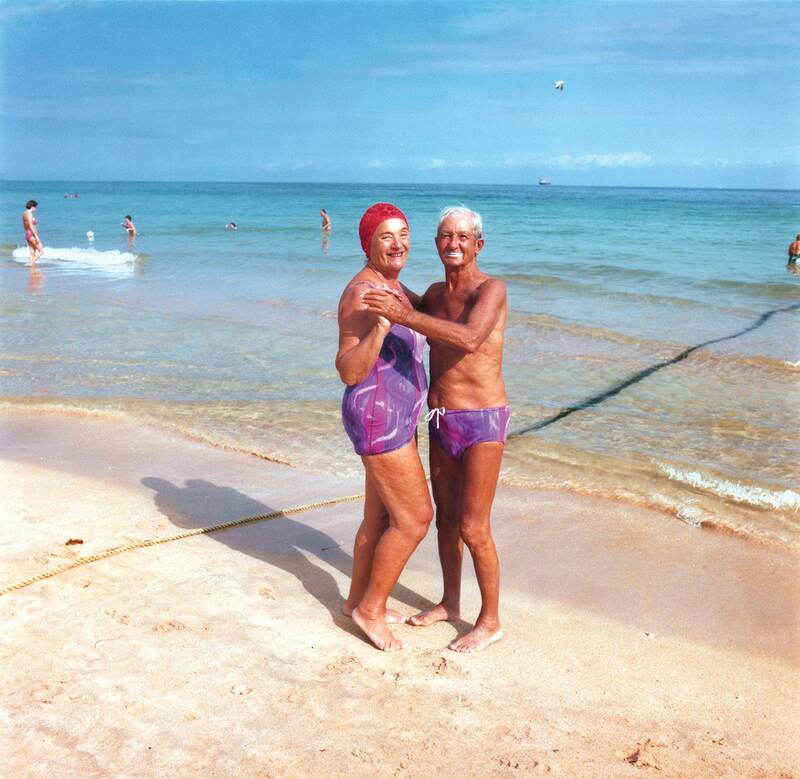 First, they are quite intimate photographs shot - I'm guessing - in many cases without the permission of the homeowners (? 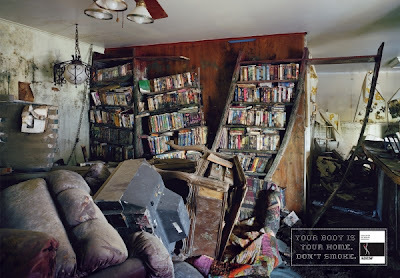 ), showing the devastation wreaked by hurricane Katrina in ordinary homes. Then, they are taken entirely out of context (in fact, for the ads to work the context of the photographs needs to be essentially unknown) and used as a sort of metaphor for the internal destruction smoking causes to our bodies. A good idea, and even though this is for something of a "good cause", is this, I wonder an appropriate use for such images? I'd also be interested to know, did Polidori donate the use of these images, or was he actually paid a standard advertising usage fee? I think it might make a difference, but I'm not sure how much? Is it, as one commentator has put it - simply not in good taste? below - a non-ad Katrina photo from Polidori - at least so far. Roofing Contractor anyone? polidori's work is sold by an agency called bill charles, and when i approached them about using some of polidoris' chernobil pictures for "greenpeace magazine" in spain (for the 20th aniversary of the disaster) they didn't even bother to reply. so so much for the "sincere" book intorduction about how we must never let disasaster like this happen again, art it appears, in this case, is all about money. Just for the record, Polidori did donate those photographs. He was asked to by the Brazilian government. I understand your concerns, but Walker Evans, & Dorthea Lange, both mixed art and journalism and captured the suffering of Americans. Do you feel the same about the WPA project. And he is no longer with Bill Charles. Cara, I don't, however, recall either Walker Evans or using their documentary work of "the suffering of Americans" as a basis for commercial advertising? I don't think these posters are either journalism or art? Even if it's for a "good cause"